Developed by ARIA and designed by ROTHELOWMAN, Austin has been named Australia's Best Residential High Rise Development for 2015 at the Asia Pacific International Property Awards. Taking place in Kuala Lumpur, Malaysia, the Asia Pacific International Property Awards celebrate excellence across the property industry worldwide and promote an international standard of design. A multi-residential project, with a significant hospitality and retail offering at ground level, Austin sits in the heart of $4 billion worth of state infrastructure. 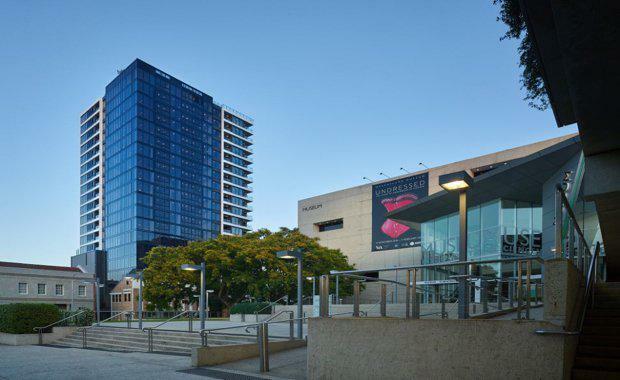 Acting as a gateway to the Queensland Arts Precinct and providing a link between the CBD and South Brisbane, the development laid the foundation for a new neighbourhood hub. Travelling to Kuala Lumpur to accept the award, ARIA Residential Development Manager Simon White said, "We are extremely honoured by this prestigious award. To have our project named the best of its kind in the country is incredibly gratifying and a credit to the collaborative efforts of all involved. "We worked closely with the Brisbane City Council to shape the future intent for the precinct and achieve the desired urban outcomes envisaged in the South Brisbane Neighbourhood Plan. "Acknowledging the project's local significance, Austin has been commended for working within challenging urban conditions and catalysing development in this precinct. ROTHELOWMAN Principle and project lead Jeff Brown said, "It is rewarding to witness the evolution of South Brisbane - from a suburb dominated by industry since the early 1900s to a high-density residential and commercial precinct - and know that we played an active part in creating that. "Forging links to the CBD via numerous pedestrian bridges, the luxury offering promotes connectivity. "Through the introduction of highly activated ground-level retail and lobby spaces we were able to make use of the adjacent under-utilised Fish Lane and promote resident and civic engagement with the building," Mr Brown said. Whilst the mixed-use design strives to provide maximum amenity to both the public realm and the apartments within, the design aesthetic exemplifies the area's shift toward taller, slender, high-density residential living. "Austin is truly definitive of its location with subtropical apartment living that relates to the scale, singularity and materiality of the adjacent CBD skyline," Mr Brown said.